Deepavali, that is celebrated pan-India with a riot of fireworks and firecrackers. And, with firecrackers comes pollution. Last year, air pollution hit dangerous levels as India celebrated Diwali, the Hindu festival of lights. As per reports, the PM2.5, tiny particles suspended in the air that can cause diseases when lodged into lungs, jumped to dangerous levels, especially in the Indian capital. Just to give a little insight of how bad the situation was, we would like to add the report by the WHO that stated that, if uncontrolled pollution which will play a havoc with the National Air Quality Index India, will be associated with 15% higher long-term mortality risk. 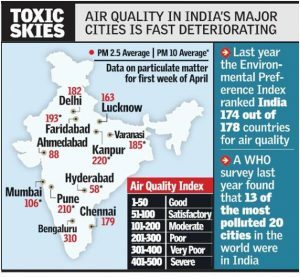 It’s a well-known fact that New Delhi out of all the cities in the Capital has the most air- pollution problem as it ranks amongst the 11th worst polluted cities in the world, with an annual average PM2.5 measurement of 122. The average Air Quality Index Delhi reading has been considered very as per reports by the Central Pollution Control Board’s air quality index bulletin. A distorted air quality index is the most dangerous for children as they are the most vulnerable to air pollution. Scientifically, this is because they breathe twice as fast as adults, thereby taking in more air and pollutants i.e. adversely affecting their growth and immune system. There have been innumerable cases in today’s times where people are being born with cardiac or lung ailments. Also, the number of infant deaths has also increased ever since the Air Quality Index has deteriorated. There is widespread agreement that pollution and the quality of air are bad. However, the issue gets stalled there because people don’t positive action towards the issue. This is because they’ll only take action if they understand the issue. Therefore, we need to spread awareness about what the government or other agencies mean by Air Quality Index. Therefore, we need to educate the audience about Air Quality Index India. What is an Air Quality Index? An Air Quality Index India (AQI) is an index for measuring daily air quality. The Air Quality Index India is used by government agencies to communicate to the public at large as to how polluted the air is at present and how polluted it’ll be in the future. Therefore, in layman’s language Air Quality Index Delhi or Air Quality Index Gurgaon, tells you how clean or polluted your air is along with it’s associated health effects in Delhi and Gurgaon respectively. As the Air Quality Index increases, the likelihood of experiencing adverse health effect also increases. Corresponding to the national air quality standards, different countries different air quality decides, for instance, Air Quality Health Index (Canada) and the Pollutant Standards Index (Singapore). Anticyclone, temperature inversion, or low wind speeds let air pollution remain in a local area, leading to high concentrations of stagnant pollutants in the air, chemical reactions between air contaminants and hazy conditions. How is the AQI commuted? AQI is commuted through an air monitor that collects data of the air pollutant concentration over a specified averaging period. The concentration of the pollutants with respect to the time span represents the dose of the air pollutant in the country. Following which an epidemiological research is undergone that lists the given health effects corresponding to the level of pollution or air quality. “Air pollutants vary in potency, and the function used to convert from air pollutant concentration to AQI varies by pollutant”. In layman’s terms, AQI is a yardstick that runs from 0 to 500. The higher the National Air Quality Index India New value, the greater the level of air pollution, therefore the greater the probability of health concerns for the public. For example, hypothetically, if Air Quality Index Delhi is at the value of 50 and Air Quality Index Gurgaon is at 300, the former is better than the latter by 6 times. For instance, if Air Quality Index Delhi values below 100, it will generally be thought of as satisfactory. When AQI values are above 100, air quality is considered to be unhealthy-at first for certain sensitive groups of people, then for everyone as AQI values get higher. Air quality index values are grouped into categories or ranges. Each category or range is associated with a descriptor, a color code, and a standardized public health advisory. AQI is a ‘One Number- One Colour-One Description’ for the common man to judge the air quality within his vicinity. Under the current measurement of air quality, 8 parameters. There are six AQI categories, ranging from Good to Severe. And, the AQI takes into account eight pollutants (PM10, PM2.5, NO2, SO2, CO, O3, NH3, and Pb) for which short-term the National Ambient Air Quality Standards are prescribed. Poses little or no health implications. 51–100 Good Air quality: Acceptable. Some pollutants present but in low levels. 101–150 Lightly Polluted Air Quality: A little over acceptable. Individuals with breathing or heart problems should reduce outdoor exercise as they feel the difference in the air. But, the general public is not likely to be affected. 151–200 Moderately Polluted Air Quality: Bad. Everyone may begin to experience the harmful effects of the pollutants present in the air. Individuals with breathing or heart problems, especially should avoid outdoor exposure. 201–300 Heavily Polluted The entire population is more likely to be affected by hazardous pollutants in the air. Children and elders should remain indoors and restrict outdoor activities. As people with breathing or heart problems will experience reduced endurance in activities. 300+ Severely Polluted Health emergency and alert as everyone may experience more serious health effects. If there is increased awareness about Air Quality Index India and it’s health impacts depending on the various categories can help to reduce the incidence of air pollution to the most vulnerable people. Since acute exposure to acute exposure to air emissions may cause substantial harm to the health of the masses in general. Therefore, there are variables that can be taken to make people aware of the air-emission reports so that they can plan they’re outdoor activities accordingly to reduce the intake of highly polluted. The Air Quality Index Delhi has been above 500 in the second week of November’17. Even in Air Quality Index Delhi, there are some areas that are more hit than others such as AQI in West Delhi’s Punjabi Bagh (Air Quality Index of 868) and south-west Delhi’s RK Puram (Air Quality Index of 796). The National Air Quality Index reading records up to 50 i.e. considered ‘good’, and up to 100 is considered ‘satisfactory’. A reading between 401-500 is ranked ‘severe’ on the index, which means the air is perilously filled with pollutants. And, Air Quality Index Delhi often records readings above that mark. You can advise elderly people or children to avoid outdoor exertion. People with cardiovascular diseases shouldn’t step out. In extreme cases, declare a holiday to reduce safeguard not only the sensitive groups but also the masses in general. Encourage voluntary measures to reduce air pollution, such as using carpool. Recommend people to use masks to keep fine particles from hampering the lungs.